One of the most successful tactics of the evil inclination inside each one of us, is to cause a person sadness and worse yet, depression. When one is tired and weary, he makes his move to bring the person down even further. Not only with doing foolish things, but worse yet, the guilt that follows afterwards. 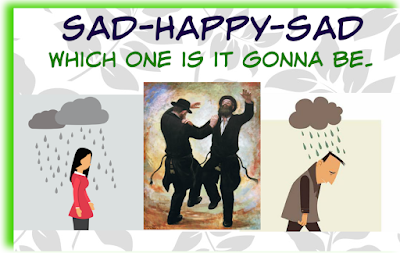 In the Holy book of the Tanya, he writes that the only way one is able to be victorious over the evil inclination is with Simcha - enthusiasm and joy, which is not tainted by any worries or sadness. The Tanya compares this, to two people fighting. Even if one is naturally stronger, the weaker one (the evil inclination) will defeat him if he lacks joy and enthusiasm. The G-dly inclination inside every person is the spark of G-dliness, and is compared to light. By Nature, naturally, a small quantity of light will chase away much darkness, but the person must be happy and joyous. I did not say he must enjoy himself, I said, he must find joy in his life. This is one of the very powerful reasons why, the first acknowledgment we make as we open our eyes every morning, is gratitude to G-d, for returning our souls to us. This demonstrates G-ds faith in giving us another day to fulfill and accomplish. The spirit of internal strength, the flow from ones soul – the internal candle - does not shine on someone who is sad or downhearted. The book of the prophets tells us a story, that when Elisha became angry with Yehoraam the king for his wicked ways, the spirit of prophecy left him. It was only after music was played for him, and his mood was lifted, that his spirit of prophecy returned. In the book of mysticism, the Zohar, it says….. The way we act here in this world, is the way we are dealt with from above. 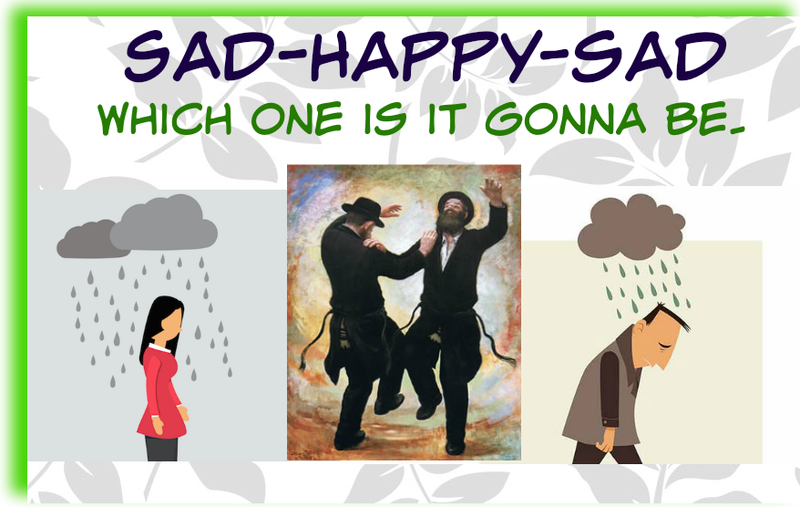 When a person acts in a happy, joyous, grateful, relaxed, and open mind-set, G-d will deal with him in the same way, in a happy and joyous way. Once, a great Rabbi crossing over a bridge saw a man struggling to save himself in the waters below. Seeing no way that he could save the fellow, he called out, “send regards to the big fish (Leviathan) at the bottom of the river”. At that moment – G-d came to the fellows’ aid, and the fellow was able to catch onto a plank of wood and save himself. The Rabbi later explained that due to the man’s broken spirit, he could not be helped. “When I made that foolish funny comment – in that moment of distraction, he was able to save himself with the power of the joke”. “The mind is always working”. A person should consciously try to keep his mind occupied with things to accomplish, so he does not have the time, and does not give his mind the chance to think sad thoughts. When the evil inclination comes to a person and tries to persuade him with all kinds of foolish arguments that he has every reason to feel sad, the person must respond without entering any logical arguments. “You are bad and trying to trick me, even if what I did or who I am isn’t perfect, I have an obligation to always be happy” and immediately divert his mind to positive and uplifting thoughts AND NOT LOOK BACK.